Air Filter Size: 16" x 20"
Air Filter Size: 20" x 20"
Air Filter Size: 23" x 20"
The Goodman GSX16 Air Conditioner is the latest high efficiency 16 SEER Air Conditioner from Goodman and provides a mix of performance, efficiency and value unmatched in the industry. The GSX16 Air Conditioner features operating sound levels that are among the lowest in the heating and cooling industry. With its 16 SEER rating, the GSX16 will help reduce energy consumption throughout the life of the system. 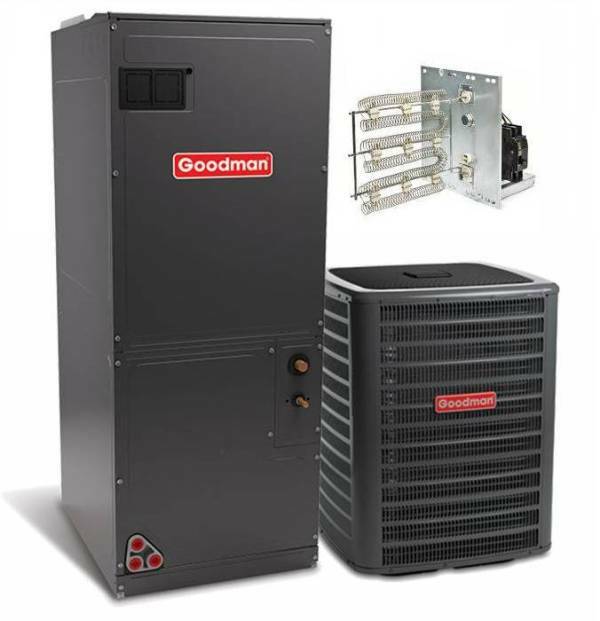 The Goodman ASPT Air Handler have replaced the old series with a brand new improved model. SmartFrame Sub-Structure is at the heart of this design which adds lateral stability to the chassis, new mounting locations for internal components and additional insulation retention. It also features an ECM motor achieving high efficiency in a multi-speed air handler. These new models are 4 way multi-position, capable of upflow downflow or horizontal airflow direction. The ASPT model has a painted finish and factory-mounted thermal expansion valve (TXV). *All units with installation have our special price. Basic installation price is show in each unit. Exclude city permit, attic, roof, cooper lines, crane services. Installation price is available for local customers from Miami Dade County to Broward County only. All our customers from Palm Beach, Naples, Fort Myers & the Keys add an extra $ 250.00 for installation. Please check with us before any job if you do not live in this area or your job is more complex. Prices are subject to change without notice. Installation price included free accessories.